Ryan Kramer is a student at UNC Chapel Hill, where he is pursuing his B.A. in Philosophy with minors in Chemistry and Biology. After graduation, he plans to earn his MD and Masters in Bioethics through a dual degree program. Eventually, he hopes to research bioethics and health policy while practicing as a pediatric specialist. In the following article, Ryan provides a road map for the aspiring doctor, outlining the steps of the journey. Your heartbeat thuds in your ears, as your blood pumps wildly through your veins. It’s not life or death, but it sure feels that way. You turn around and there’s the prompt in stark black letters on the whiteboard. After shaking clammy hands with your interviewer, you sit down. The Multiple Mini-Interview (MMI) has begun. Created in 2002 by McMasters University, MMIs generally consist of a series of brief interviews in a timed circuit. In the past decade, medical schools have increasingly employed MMIs in lieu of one or two traditional long interviews, so it’s important to familiarize yourself with the format. But what prompted the switch in the first place? According to the Association of American Medical Colleges, MMIs “[produce] a more reliable assessment of a candidate and limits interview biases due to the number of interactions.” Whereas a few long interviews are much higher stakes and a slip-up will have greater impact, MMIs aren’t make-it-or-break-it precisely because there are so many mini-interviews (usually between 6 and 12).The theory behind the MMI is that multiple smaller interviews will allow interviewers to better understand your values, thought patterns, and other soft skills such as the ability to empathize and problem-solve. MMIs are often centered around a specific ethical dilemma or scenario. Although that might sound intimidating, it’s also a benefit for you because there are no right answers. However, while there may be no right answers, there are better or worse ways to answer an MMI prompt. These questions should act as a framework that will guide your thoughts towards crafting a robust and thoughtful answer to any prompt you’re given. 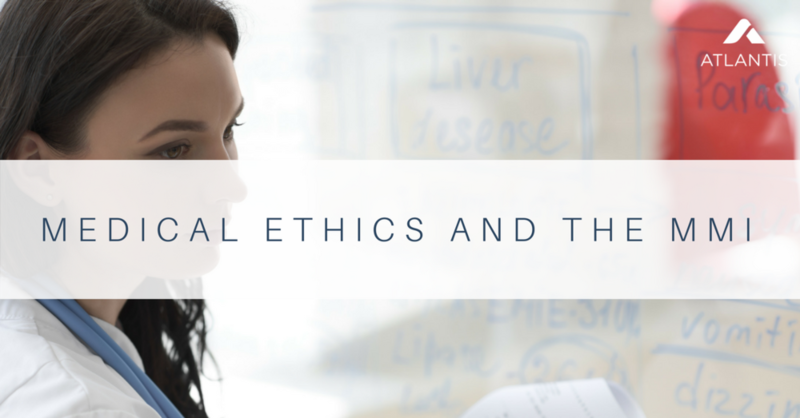 In this article, I’m going to give some tips on how to approach MMI interviews, with an emphasis on ethical problems. I won’t give any solutions, but I will equip you with the right questions to ask yourself. These questions should act as a framework that will guide your thoughts towards crafting a robust and thoughtful answer to any prompt you’re given. Remember, it’s more about your approach than your answer. Here’s a general tip to start: Relax. Look, I’ve tried to cram philosophy papers the night before they’re due; but, frankly, that approach never turns out well. Some situations require a calm, slow thought process; philosophy and MMIs are some of those instances. If you’re frantic, you won’t be able to form coherent thoughts. Take a deep breath -- the goal is not to convince your interviewers of your particular viewpoint, or even to fix the problem at hand. Your goal is to show your values and how you approach problems. Remember, as Dr. Jessica Friedman, a former medical admissions committee member at Mt. Sinai School of Medicine, says: there’s no wrong answer to an MMI prompt. To start, let’s examine an important bioethical problem (and personal interest of mine) that often shows up in MMI questions: resource-allocation in times of scarcity. Often, we have a shortage of resources and a preponderance of need. Unfortunately, this means that not all those who need help will receive it. But how do we choose who does? "You have two patients in front of you: one has liver cirrhosis and the other has liver cancer. You decide: who should get the liver transplant?" You have two patients in front of you: a 50-year-old man (Patient X) whose liver has degraded due to alcoholism. There are no complications; if he receives the liver, he will almost certainly recover and his system will regain full functioning capacity. Next to him is another 50-year-old man (Patient Y): a father of three whose liver is riddled with cancer. His daughter is about to graduate from high school and is planning on attending university next year. Patient Y will definitely improve with a liver transplant, but there’s no guarantee he’ll be cancer-free. To whom do you give the liver? On the one hand, we have a man who will certainly recover, but may have “deserved” his illness in the first place. On the other, we have a man who did nothing to merit his disease, but has uncertain chances for recovery. The best way to appraise a medical dilemma is to analyze it using the four principles of medical ethics. These principles were developed by Dr. Tom Beauchamp and Dr. James Childress and were published in their book Principles of Biomedical Ethics (1985). As America’s first significant bioethics text, this book soon became a standard reference, and its approach to medical ethics is widely accepted today. Let’s start with Principle 1. In this case, both patients have successfully maintained their autonomy. Each has requested an organ, and it now falls upon you, the doctor, to attempt to provide it. You are not forcing the organ on either patient, nor are you ignoring the patients’ wishes. Thus, this situation does not violate principles of autonomy. Next, let’s talk about Principle 4. This organ allocation dilemma is an ongoing medical debate that hinges upon the concept of justice. Many ask the question: Isn’t it unjust to give a liver to a patient who self-inflicted his own suffering when it could be given to a patient whose illness was tragically random? In my opinion, that is not a fair question for a doctor to consider. As medical professionals, we serve justice. But be careful not to conflate justice with revenge. It is not up to the physician to mete out punishment; you are neither the judge, nor the jury, and especially not the executioner. Our duty is not to make sure people “get what they deserve”; it is to ensure all are treated justly, i.e. with equity. Of course, your opinion may differ from mine. If you disagree, be prepared to justify why your motivations are not vindictive, and how they actually serve a greater good. One such way to approach this is to argue that an alcoholic is more likely to continue abusing alcohol and damage his liver all over again; thus, a cancer patient would be more deserving. In this way, giving the liver to a cancer patient would maximize the liver’s utility. Regardless of whether you agree, let’s examine the other facets of this dilemma. Regardless of which option you choose, make sure you have examined the situation in regards to all four principles and be ready to demonstrate how each relates to your decision. The remaining principles—beneficence and non-maleficence—often go hand-in-hand. Here, doing good can be seen as providing the liver to the person with the greatest potential for a full recovery. In this case, Patient X is most likely to make a full recovery, provided he stops drinking. Because Patient Y may suffer a relapse, his chances are lower. From this perspective, I can do more good and less bad by giving the liver to Patient X. Thus, after putting all emotion and bias aside, it seems to me that the doctor ought to give the liver to Patient X, the alcoholic. My argument hinges on Principles 2 and 3 (Beneficence and Non-Maleficence), and posits that Principles 1 (Autonomy) and 4 (Justice) are less relevant. If you disagree, you’re likely to cite Principle 4 as the basis of your argument. Regardless of which option you choose, make sure you have examined the situation in regards to all four principles and be ready to demonstrate how each relates to your decision. This is only one example of how you should approach a bioethical dilemma. Armed with this methodology, you won’t be so nervous when you face an MMI and questions about medical ethics problems. Remember, as long as you’re consistent in your principles and keep patient welfare foremost in mind, there are no wrong answers. Take a breath, speak with confidence, and go impress your interviewers!